The packaging equipment produced by Siyuan can be divided into vertical form fill packaging machinery, flow pack wrapper, premade pouch fill seal machine which are often applied for metering, filling and packaging of granule, powder and liquid materials. The packaging bags compatible with this equipment include the following styles: pillow packs, 3 side seal pouches, 4 side seal pouches, hang hole bags, sachets, and flat bottom bags etc. 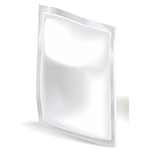 The pillow pack is a multi-functional packaging bag that is extremely popular in the industry. With the same bag size, the pillow pack has a greater capacity. Usually, the pillow pack will be used for the packaging of coffee, powdered drinks or tea. Puffed foods such as dried fruit will also often adopt pillow packs for packaging, as well as some material with a total weight over 100g. The 3 side seal pouch is sealed on 3 sides and folded on 1 side. It has similar shape with 4 side seal pouch. Compared with the 4 side seal pouch, the advantage of the 3 side seal pouch is that you can make full use of the inner space of the pouch by expanding it after it is produced. 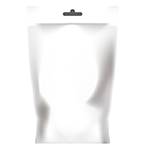 This kind of packaging bag is suitable for packing large volume products. Four sides of the 4 side seal pouch adopt heat sealing. Because of the uniform heat sealing of each side, the finished product features excellent sealing performance. 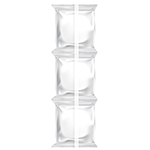 The 4 side seal pouch is mainly used for food packaging, medical packaging, and chemical packaging industries. The hang hole bag is a bag with a hangle hole punched into the top so that it is conveniently hung up. 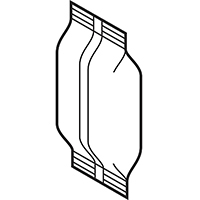 The hole can be divided into two types: round hang hole and inverted T hang hole. The hang hole bag is mainly used for the packaging of food and chemical products. In the food packaging industry, this bag is mainly used for nuts such as multi-flavored peanuts, fava beans and melon seeds. 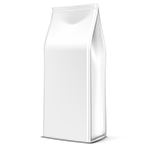 In the chemical packaging industry, it is mainly used for detergent. Sachets are connected bags of different numbers which can be set via the control system. The packaging machinery can automatically cut off the package according to the set number. This kind of sachet is mainly used for food packaging and chemical packaging solutions especially in the shampoo industry. The flat bottom bag is a kind of bag which can stand upright on its own. 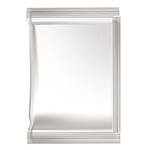 It is suitable for storage on bulk goods shelves. The bottom of the bags adopts a flat design for standing and the top side adopts a direct sealing or zipper design. This kind of packaging bag is usually a premade bag. Then it will be filled by the pouch fill seal machine.